I love your balloon anchor and watched the video. Now I need supplies! 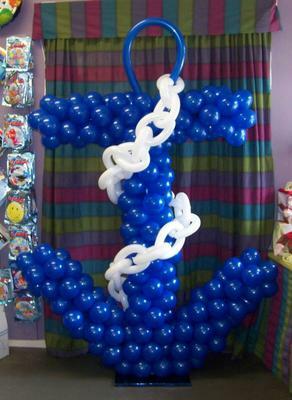 When I go to make the balloon anchor, what size balloons do I use for the anchor and what size are the link balloons? Where can I get them in the US? Glad to hear that you like the balloon anchor sculpture. You are referring to the video shown on this page, right? The anchor is made of 5 inch round latex balloons, blown up to 3 inches. The balloons used for the chain are twisting balloons. I think they are either 260Q or 350Q - they look thicker than the 160Q type. Here's an example for a pack of 100 dark blue 5 inch balloons from Qualatex. And here are the 260Q balloons, in white, also from Qualatex. Comments for I love your balloon anchor and watched the video. Now I need supplies! They are great and you do not have to have a sellers permit to buy from them. Qualatex balloons are the best.